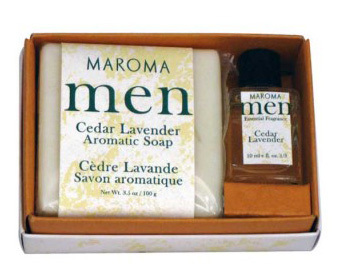 Men's Soap & Perfume Gift Set - Cedar Lavender 3.5 oz / 10ml (Maroma) - Penn Herb Co. Ltd. This aromatic soap and fragrance oil gift set is formulated from natural botanical oils and butters and a rich aromatic blend containing essential oils of Himalayan Cedarwood, Lavandin, Orange, Patchouli, Bay Laurel & Elemi. : Cocos Nucifera (Coconut Oil), Aqua (Demineralized Water), Sodium Hydroxide, Helianthus Annuus Seed Oil (Sunflower Oil), Sesamum Indicum (Sesame Oil), Ricinus Communis Seed Oil (Castor Oil), Garcinia Indica Seed Butter (Kokum Butter), Mangifera Indica Seed Butter (Mango Butter), Stearic Acid, Parfum (Fragrance), Citrus Aurantium Dulcis Oil (Orange Oil), Bulnesia Sarmientoi Wood Oil (Guaiac Wood Oil), Cedrus Deodora Oil (Himalayan Cedar Wood Oil), Lavandula Hybrida Oil (Lavandin Oil), Laurus Nobilis Oil (Bay Laurel Oil), Pogostemon Cablin Oil (Patchouli Oil), Canarium Luzonicum Gum Oil (Elemi Oil). NO artificial colors or preservatives. NO animal testing or ingredients. NO gluten, parabens or phthalates. NO petroleum derivates.